Home » Blog » general dental » Fall is here! Why you should schedule your dental appointment NOW! Fall is here! Why you should schedule your dental appointment NOW! Why you should schedule your dental appointment NOW! It’s that special time of year. The kids are headed back to school, the late summer air turns crisp, and the vibrant greens all around turn into beautiful russet reds and browns. These are all things that we know about autumn. 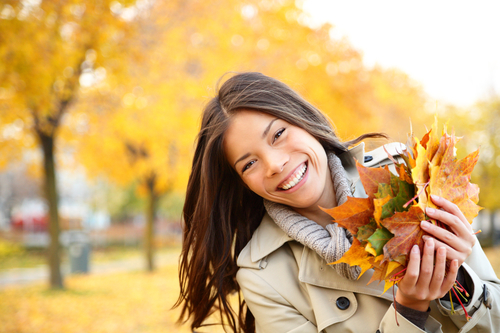 What many people don’t know is that this beautiful time of year is also the best time of the year to schedule that bi-annual dental check up visit. Let’s take a look at a few of the key reasons why. Most people today have a cell phone plan or another type of cyclical subscription in their account list. We have gotten used to having benefits that automatically accumulate and roll over to the next month or year. But our dental plans aren’t built this way. If you have an employer issued dental plan, there is a chance that you may have employer issued benefits that include dental spending benefits or flexible spending benefits. The way that these benefits work is that they are available to you throughout the year for use, but what is very important to understand is that if these amazing benefits are not used by the end of the year, they do not automatically roll over to the next year. In fact, they don’t roll over at all. They expire. These provisions exist to help each employee to cover dental basics like routine check-ups, x-rays, and annual cleanings and you have already paid for them. Some may only require a small co-pay fee or no payment at all. If you have an employee issued dental plan, be sure to schedule an appointment to use your benefits before the year’s end! It’s the most BUSY time of the year! Since fall is here, that means that the holiday season is right around the corner. Many don’t know, but the holiday season, and more specifically the months of November and December are the absolute busiest months in many dental offices. Everyone is getting ready to show off their smiles in holiday pictures and schedules fill quite quickly. Booking appointments now, not only helps you to be able to beat the winter rush, but it gives you an essential checkup that can pinpoint any budding dental issues before the cold weather comes. In addition, cold weather can be tough on teeth and it can also be rough on crowns, veneers, and bridges. Scheduling your dental visit now can not only source any stress cracks in time to fix them before the holidays, but it can also help you to avoid getting caught with an untreated toothache or cavity in the middle of a Aunt Mildred’s family party! If you haven’t scheduled your annual dental checkup there’s still time to avoid the rush. Call our offices and we can get you set up in no time!